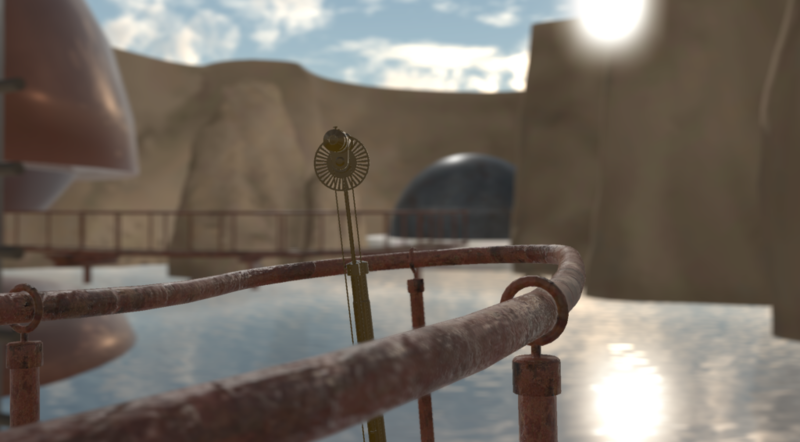 This website contains many spoilers for Riven: The Sequel to Myst. It's an amazing game, so don't spoil yourself! If you're curious about what this website/project even is, it's a remake of the aforementioned game. You can learn more about our project by visiting What is Starry Expanse?. I've played the game. Let me in! I'd rather play the original first! Since its birth, we had always planned for Starry Expanse to be a 3D recreation of Riven. 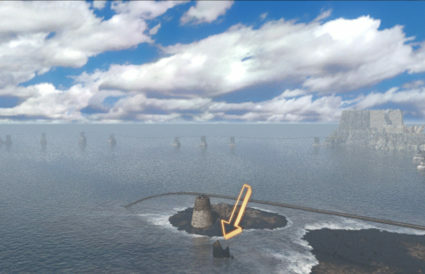 realMyst had just come out, so free-roam 3D just seemed like the way to go. But as time has gone on, it has become more and more apparent that this may not be the best option for us. Since this realization, we’ve been working hard to steer the project in a direction that we’re all happy with. This process has led us to identify and remedy many serious flaws in our old structure. So, we looked at what was doing well. Our favorite games that we actually play. Temple Run, Lords Mobile: War Kingdom Paper Mario, Sago Mini Babies Dress Up, Sand; what do all of these have in common? That’s right, they’re 2D. All successful games ever – and especially modern ones – are embracing 2D, and more specifically 2.5D technology. So what does that mean for Starry Expanse? Well, I’m happy to announce that we have assessed and implemented a far superior and more accessible control scheme, and implemented a highly realistic physics system that adds a whole new level of realism to the game. Additionally, we know how badly the community wants us to use the original actors’ performances in our game. We heard you, and we’ve listened. And best of all? The game will be free to play! The microtransactions are entirely optional, and you can play through most of the first part of the game without even thinking about them! So, without further ado, we’re proud to announce this far superior direction, fully realized in glorious 2.5D. Utilizing 2.5D gives us such a fresh, unique perspective into the world that’s just not possible in first-person. And development time with this new style is so much easier, that we’ve already been able to work up a small demo! While this is by no means the final product, we think it gives a very good idea of what the finished game will be like! We’re so excited for you to join us in this new chapter of Starry Expanse, and can’t wait to hear your positive comments about our demo! Written by Hollister, directed by Hollister, produced by Hollister, hair and makeup by Hollister, demo created by Hollister and Stuart, credits by Hollister. We spend a lot of time examining, deconstructing, and generally just staring at still images of Riven. They’re our best reference, and a window into that world, but they also only paint part of the picture. It’s easy to forget when you spend so long staring at still images that they’re meant to represent a living, breathing world – and it’s our responsibility to realise that world not just with accuracy, but also with depth. One invaluable tool that helps remind us to step back from matching geometry one-to-one and look at a scene holistically is Riven fan-art, and we’d like to give a shout out to someone we’ve found recently who’s given us a new perspective on an old environment. Lauren Herda’s Riven Islands Exocosmic Cultural Reserve series is a colourful and creative re-imagining of each of Riven’s five islands as National Park tourism destinations. They’ve inspired us to look at our work from more than just the angles that the original game provided, and to consider the Age of Riven unconstrained by the frame of a 608*392 image. For more information on the series and to see more of Lauren’s work, follow this link! If you’ve created or discovered some fan art that you believe breathes new life into the world of Riven – we would also love to see it. Share it in the comments, find us on our Discord, or email us at general@starryexpanse.com. What a crazy year it has been for the Starry Expanse Project! 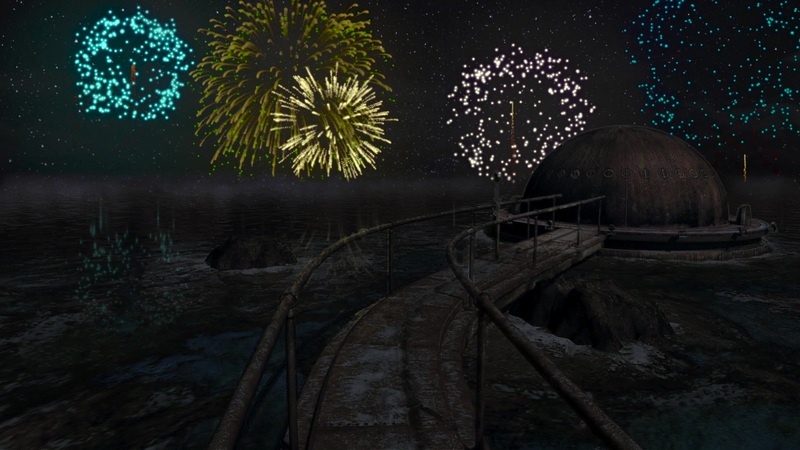 We pioneered new methods for both camera matching and browsing the original Riven’s files, welcomed you all to a new community Discord server, and joined in on the Myst#25 celebration. All of this on top of the most productive year the project has ever had, with a record number of assets completed, and the team over doubling in size! We’d like to thank all of you who’ve followed us this far on our journey, we greatly appreciate your support. See you in 2019! Greetings to fellow Riven enthusiasts everywhere! The Starry Expanse Team hopes you all are enjoying a beautiful autumn this year. Project co-founder Philip Peterson here, coming at you with some words from a soul that has stared at images of Riven for over ten years. To open the season, I want to showcase a different side of the project. 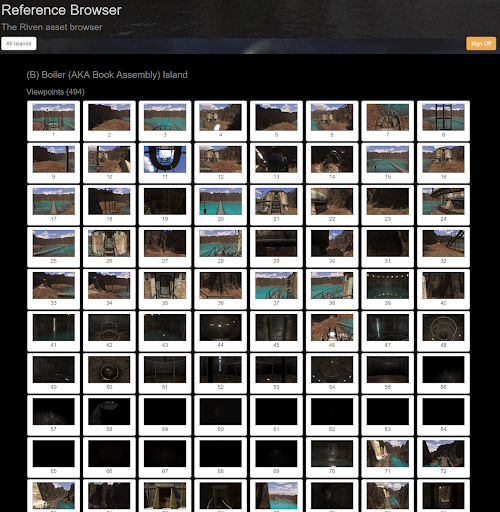 Quite frequently, in the course of modeling and texturing assets, and when referring to specific areas of the game during our meetings and various conversations, we find ourselves in need of the ability to quickly find a particular image or movie from Riven. The most efficient way to do this, perhaps oddly, is often to perform a quick YouTube search, find a video playthrough of Riven, and scan through it to find the shot that we need. 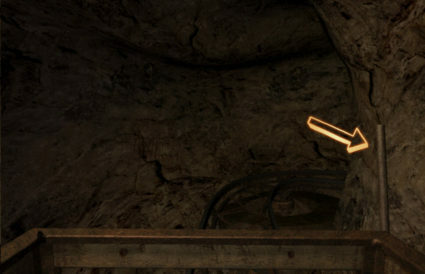 However, since Riven is a nonlinear game, causing these videos to be difficult to scan — and also because these YouTube links often go stale and end up broken (possibly due to the blatant copyright infringement that they sometimes involve) — links to timestamps in YouTube videos are not ideal for our use cases, which include embedding in documents and emails that might be read years down the road. There is also the downside of video quality on YouTube, which is especially bad for things like these walkthroughs, as the source material (Riven images and videos) is already decently compressed, which when compounded with YouTube’s aggressive compression, leads to a bit of an artifactilicious mess. There is a program called Riveal created by a guy called Ron Hayter, which you can use to extract Riven FMVs and static images. However, as the potential future Starry Expanse team member that you are, how would you link someone who is new to the team to one of these images? First, you would have to explain how to download and run the program, and also they would have to extract all of Riven’s images before being able to see the image you were talking about. 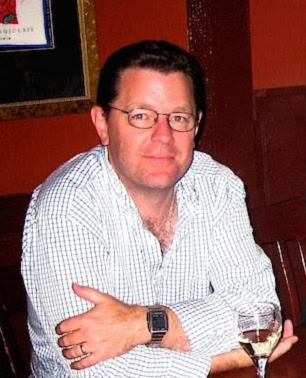 All of that changed when Chris Mumford joined the project. The Riven Reference Browser allows artists to quickly scan Riven for clues. The Reference Browser allows team members to easily scan through all the shots in Riven, finding just the viewpoint they need, and then link that viewpoint to another team member. The utility even allows the user to see related images and viewpoints. Each still shot from the original game can be grouped into viewpoints automatically because of the naming convention in the files in Riven’s release. In the breakdown of a particular viewpoint, each state of the scene can be seen. In the telescope viewpoint above, for instance, the telescope has been lowered to a different level in the left-hand state. The result is an easy to use utility that anyone on the team can use to refer to an arbitrary picture from the game, for all of eternity… until the suns burn out and the universe dies a fiery heat death. But realRiven will be released before then, we assure you. The source code for the utility is available on our GitHub, along with much of our core gameplay code. There is still much left to do with the Reference Browser; the ability to search for “tree” and see all the trees is something that would be a huge boon to the material creation side of Starry Expanse. Rock on, and thanks for following the project! We are always looking for new software engineers and game developers to join the project. If you are or know a talented software developer or artist, please shoot us a line at general@starryexpanse.com — we’re always looking for help! Welcome to our newest member on the project, Samuel Sefer, who has already made some very exciting contributions. More details to come! Happy September everyone! Stuart Attenborrow here, a 3D Artist and one of the team’s camera matching specialists. As you know we’ve been focusing on Boiler Island for most of this year. That trend has continued post-Mysterium and we’ll share our overall progress with you soon, but I’d like to take a moment to take you behind the curtain on a specific area I’ve been working on recently. If you’ve been in our official Discord server you may have seen my rant about the cart tunnel on Boiler Island. Today’s update is a bit of a director’s cut of that rant, complete with example pictures. Enjoy! The cart tunnel is one of those areas you breeze through without much thought. It’s dark, and you only see it for a brief time before being dumped unceremoniously down the chute and into Boiler Island proper. It’s possibly for these reasons that there are a few rough edges in the tunnel that nobody really notices (myself included). Until you try to rebuild it, that is. Here are my top five quirks that the team identified as we brought this area into real-time 3D. For starters, here is one that’s easy to spot. 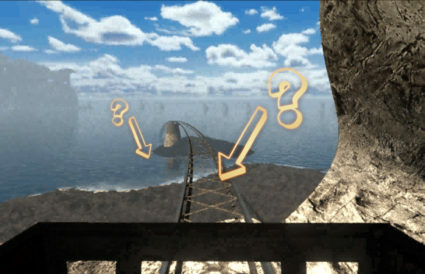 As your cart rolls into the tunnel you can see that the track bracing runs all the way to the end of the line. If this is the case, how exactly do you fall down the chute? Let’s check that out. As the bottom of the cart opens and you fall through, not only does the bracing mysteriously disappear, but if you take a look at the Boiler Island arrival animation frame-by-frame you’ll notice that the bottom of the cart has gone missing entirely! Magic! Another significant change between shots. 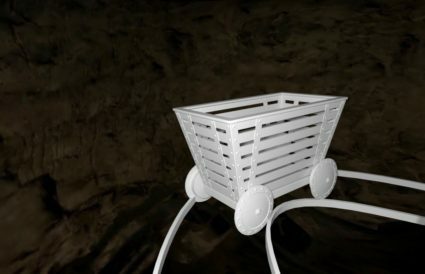 Depending on your position in-game, a small rock and a support pillar for the cart track will come and go. We can only assume changes were made right up to the last minute, and some stills were not re-rendered. That’s game development for you! At the very end of the famous cart ride from Jungle Island, there is a period of complete blackness before the player sees the light at the end of the tunnel (literally!). The cart then turns on a dime around the corner to hit the buffer stop and end the ride. Unfortunately for us, it turns out that corner is actually way too sharp for the cart to actually make! As you might expect, we are experts at playing Rivenese spot the difference. Have a look at the above image, and you might spot it too! 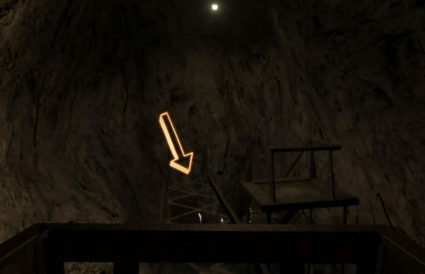 The lever next to the cart is missing in the arrival animation, but reappears when you’re standing next to the cart. It also moves between the few images within the tunnel. We assume returning via the cart was a later addition. We hope you’ve enjoyed this little tour through our daily work to parse the world of Riven into real-time 3D for you all to explore. It’s one hell of a ride! We apologise to those still waiting on the recordings of our Mysterium presentation. The folks at the Mysterium Committee are still working on editing down the whole convention’s worth of footage, and these things take time! We’ll be sharing the videos as soon as we receive them. Edit: It looks like our Mysterium presentation has been up on the MysteriumCon channel for over a week! You can see it here. Thanks to user commenter P-K-V for letting us know! Please welcome our newest team member, Alexander Diener – a multi-talented programmer! It’s been a whirlwind few weeks for the team and we have a lot to share with you. Last weekend we were proud to attend the annual convention of all things Myst, Mysterium, in beautiful St. Louis Missouri, and what a weekend it was. While those who attended catch up on their sleep and recover, we’d like to share some news with those of you who couldn’t make it. Recordings of the full presentation will be available soon. That’s right! We’re very excited to finally announce that we are officially developing realRiven for virtual reality. Those of you who’ve been following the project for a while and know our previous stance on VR (best summarised by a casual “VR is cool, but it’s too much work”) may have questions as to what’s changed. Simply, the tools for developing a game in VR have become more ubiquitous and easy to use, and our team now has several members with experience in shipping titles for VR. We have the talent and the technical barriers are no longer an issue, so we’re pleased to make this announcement and we hope you’re as excited as we are. If you have any questions about our decision to support VR (or anything else, for that matter) feel free to drop by and ask us in our official project Discord server. 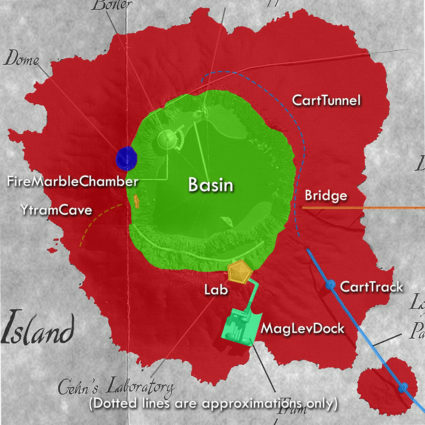 Connecting the disparate parts of each of Riven’s islands together so they are both accurate to the original game and ensuring that they make realistic sense can be a challenge. Often it feels like assembling a jigsaw puzzle where the pieces never quite fit together. 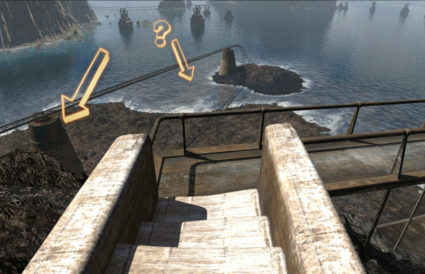 The different ‘zones’ of Boiler Island. We work on each separately, and then combine them in-engine. It’s no secret that Cyan cheated all the time when developing the final shots of Riven. Objects move between shots for better composition (plays havoc with our camera matching software), and sometimes whole areas were changed later in development which had knock-on effects that were never addressed (Survey Island is the biggest offender in this category). One area in particular that we have been struggling with recently is the Ytram Cave on Boiler Island, newly modelled by our talented artist Andrea Notarstefano. This is a narrow tunnel with a walkway that connects to three other areas. Luckily one of those areas is a dead-end (which makes things easier), but the other two require us to reconcile the cave’s position with the rest of the island, and we’re having difficulties getting it to match the cameras we have placed in the scene. As you can see, despite the cave (in orange) matching our placed cameras, it sticks out the back of the crater terrain, and fails to line up with the duct (in blue) which is meant to take us in a straight line to Gehn’s Lab. What a conundrum! The solution, as always, involves compromise. Obviously the cave needs to fit in the terrain, but we don’t want to drift too much from the camera match which represents the layout of the original game. Our solution is to curve the walkway around by extending that first bend in the walkway, making it run more along the line of the terrain. We can then adjust the terrain to cover any gaps. We’ll also use some Unreal-engine wizardry to make it seem like the duct is running in a straight line, when it in fact doesn’t. 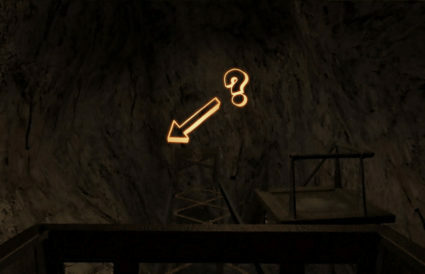 Players will never notice the switch, and the cave will look as close to the original as possible. I guess sometimes when a jigsaw doesn’t go together, you just have to use scissors. 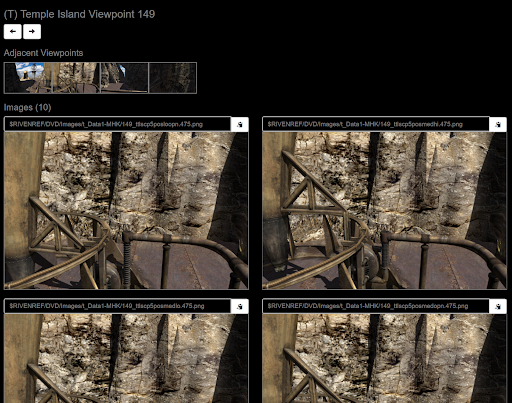 Just another hurdle to jump in the process of bringing Riven to realtime 3D!